This is Neides tipularius, a widespread bug in the western part of the Palaearctic region. It feeds on a wide range of plants: I've seen references to it on grasses, on composites, or on chickweeds. It prefers drier regions such as coastal dunes or heaths. Neides tipularius is a fairly typical member of the stilt bug family Berytidae. 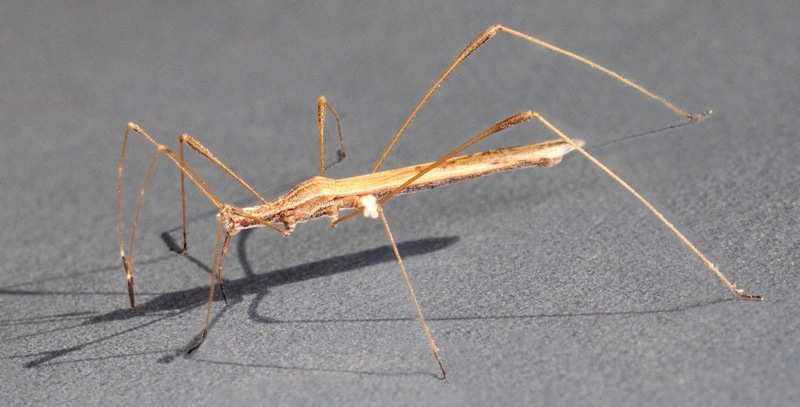 Berytids are more or less slender bugs in general but Neides is one of the more slender and long-legged ones. 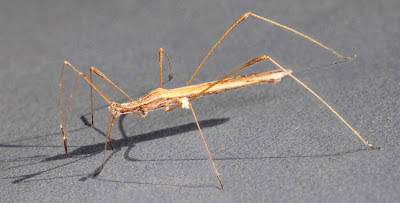 There are few other bugs with which a berytid could be confused; not only is there the wispy legginess to mark them, but berytids have distinctive long antennae with a short, spindle-shaped terminal segment forming a dark bobble at the end. Latreille (1802) did place N. tipularius in the genus Ploiaria, but that is now used for a group of small, long-legged assassin bugs with raptorial forelegs for catching prey. As with many other bugs, Neides tipularius exhibits polymorphism in wing development with flightless brachypters having narrower wings that only just reach the tip of the abdomen. Whether a given individual grows into a flying or flightless adult appears to be connected to the conditions under which they develop. Hot springs and summers have been noted to lead to increased numbers of macropterous adults. Latreille, P. A. 1802. Histoire Naturelle, générale et particulière des crustacés et des insectes vol. 3. Familles naturelles des genres. F. Dufart: Paris.